Adjust the pulley so that it is level with your waist and ensure that a single-handed attachment is attached to the cable. Stand at a 90 degree angle to the cable apparatus. Grasp the single cable attachment in front of your body and stand upright. Your elbow should be bent and at your side and the attachment should be resting against your abdomen. Rotate your arm externally while keeping your elbow at your side until your arm can rotate no further, then extend your arm fully (at which time your elbow will move away from your side), squeeze the shoulder and outer back muscles briefly, all the while exhaling throughout. Slowly allow the arm to return to the starting position, inhaling throughout the movement. 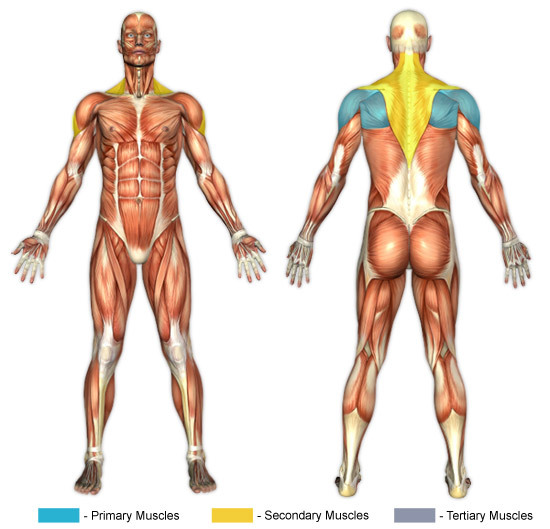 In addition to working the rear shoulders (infraspinatus and posterior deltoids) and outer back (teres minor), squeezing the shoulder blades together at the end of the lift uniquely targets the lower and middle trapezius, as well as the rhomboids. This exercise is especially good for targeting and strengthening the infraspinatus of the rotator cuff, an area which is particularly susceptible to injury. Therefore this exercise is useful for recovering from injuries involving a torn infraspinatus. When performing this exercise for this purpose be sure to begin with extremely light weights and slowly work up from there. Being as this exercise is performed one arm at a time, if the aforementioned squeezing of the shoulder blades is performed (which it should be unless contraindicated by previous injury), the opposite arm (the arm not being worked) should be gripping a safe place on the cable apparatus (preferably a designated handle, which cable racks often have) for optimal effectiveness. Normally this exercise is done from a standing position, but it may be done seated as well. Do note, however, that if done in this manner there are some difficulties and limitations involved, and that, broadly speaking, using a bench is not recommended for this exercise. One problem is that it may be difficult to find comfortable placement of the bench. Note that it is preferable that the bench being used is the shorter variety (chest height), as this makes it easier to avoid face full of grime from whoever used the equipment previously, and, generally speaking, it will be more comfortable. Another problem is that because the bench will be between you and the cable, the cable will thus likely scrape along the back frame of the bench as the exercise is performed. Most gyms won't be too happy with this. Moreover, this likely consequence, if realized, removes the advantage of performing the exercise with cables; the advantage being the free arc of motion that is generally encountered with cable exercises. For this reason, using a bench is not recommended.